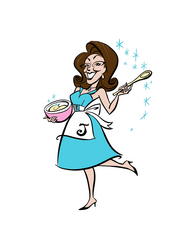 Be sure to watch the third Thursday each month at 2:00pm (mst) for the The Jane Dough Show! You never know what we'll be cookin' up! Easy delicious dinners, treats or maybe side items will be on tap. Jane likes to feature repurposed treasures when she has a new project. From cigar boxes to tricked out trashed entertainment centers to fun filled "littles" kitchen - Jane makes amazing things. Jane and her friends will entertain you with wonderful things from the kitchen, handy projects around the house, lively music and conversation! Who could ask for anything more? On a computer or smart phone!! Join Jane Dough and her friends for their live web cast "lifestyle" shows brought to you from the farm. A little something special is always cooking up with Jane! You never know who might be a surprise visitor at the farm! Jane is an "old school" kinda gal. Common sense, creativity and an extreme desire to nurture drive this domestic agent to delivering fun times, full belly's and warm memories to her many friends. A few of Jane's friends, J. Scott Howard, Emmett DeGuvera, and Andy Jensen will be regular members of the eclectic cast. The guys are great helpers in the kitchen, at the bar or for various handy projects. They also make up a wonderful band, Arizona’s Tramps & Thieves formed in 2003.